As a young boy growing up between his hometown of Brunswick, Georgia and Fort Valley, Georgia where his dad is currently the superintendent of Peach County schools, early enrollee freshman Mitchell Fineran knew he wanted to be a kicker. Mitchell was born in Brunswick, but lived and went to high school in Fort Valley, Georgia, playing his high school football career at Peach County High School. In his time as a Trojan, he went 32-51 on his field goal attempts, with four makes of 50+ yards, including a school-record 54 yard make. He also went 193-205 on his PAT attempts during his career. He was named All-State his senior year, and ranked second in the nation in kickoff yardage according to MaxPreps. 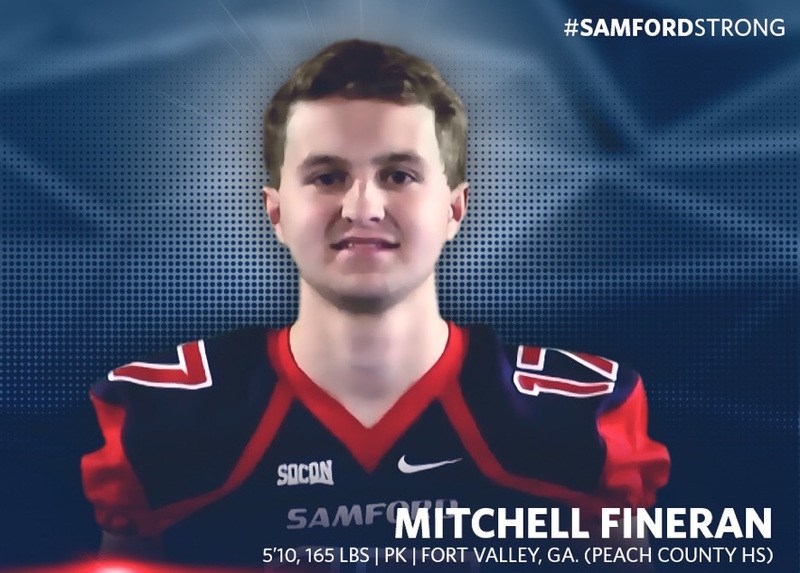 Mitchell arrived on Samford’s campus in January ready to begin his career as a Bulldog. Enrolling early had always been a plan for Mitchell, and he was intrigued when he received his offer from Samford this past December. After realizing that he had completed all the necessary classes and requirements to graduate, he decided that Samford was the place for him. Now enrolled as a freshman Sports Administration major at Samford, Mitchell is getting used to life as a college student. He did admit that at first, the transition was a bit difficult, especially starting mid-year. Mitchell’s high school team, the Peach County Trojans, has been quite successful in recent years, making numerous deep playoff runs and has consistently been a tough team to beat in Georgia’s 3A classification. Peach County has produced some great football players over the years, including many collegiate players as well as several that went on to play in the NFL. Mitchell definitely sees the idea of playing professionally as something that could potentially be in his future. During his senior season, Mitchell helped lead his team to a 13-2 record and a trip to the state championship game, which was played inside Mercedes-Benz Stadium in Atlanta, Georgia. He talked about his experience from playing in that game. Unfortunately, his team ended up losing the game to the Calhoun Yellow Jackets by a score of 10-6. An extremely controversial call late in the fourth quarter called back a touchdown catch that would have given Peach County the lead, and was ultimately a big factor in the loss. To this day, many people around the state of Georgia remember that play. “Everyone was in shock. We thought we had it. I guess one person messed it up, but sometimes it just happens,” Mitchell said. Mitchell went 13-19 on field goal attempts during his senior season at Peach County, as well as 80-81 on PATs. He kicked a career long and school-record 54 yard field goal during his senior season, as well as the 50 yard field goal in the state championship game. When asked which field goal during his high school career was his most memorable, he quickly had the answer. During his high school career, Mitchell attended numerous kicking camps around the country where he competed against some of the best high school specialists in the nation. He talked about how they were extremely beneficial in his development as a kicker. He also gave credit to his kicking coach for helping him throughout his career. “My kicking coach Mike Hollis played in the NFL for 9 years, so he definitely helped me out a lot,” he said. When asked about the toughest part of kicking as a whole, Mitchell alluded to the mental aspect as playing a large part in the kicking process. So far, Mitchell loves everything about Samford and is adjusting to his new home quite well. He likes the size of the school and how everyone has been so friendly. Off the football field, Mitchell played soccer, baseball, and basketball growing up. He also likes hanging out with friends and fishing. Samford plans to use Mitchell primarily as a kicker, but he is open to doing whatever is asked of him. He is excited to begin his career at the collegiate level next season.